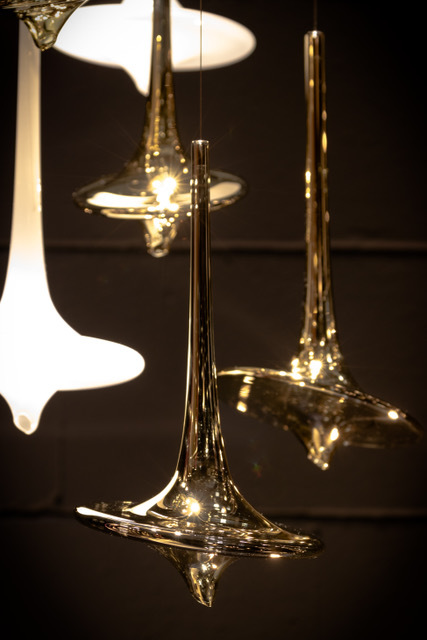 Melogranoblu's Hydra collection is enriched with a new pendant, Avatar, completely made of hand-blown glass. The subtle, almost imperceptible, steel cable creates a sort of suspended effect, as if to remember the very meaning of the term "avatar": the descent and reincarnation of a deity on Earth. Avatar will be exhibited at Downtown Design in Dubai this November. The exhibit will also feature Melogranoblu's Soap Lamp, now considered a classic. The new pendant is available in two different sizes and two finishes: metallic gold and milk white, which give lightness and elegance to the organic forms of glass.